Thinking on Joan Baez and Virgil Cain and his Danville Railroad got me to thinking about a trip I made a while back to Danville. I went up there to see Confederate Prison Number 6, which had been a tobacco warehouse before the War and was a hardware store in its most recent incarnation. Quite a place, to be sure. Seems like the city's making something of a comeback. Lots of renovation going on in the tobacco warehouse district at any rate. I also went see the last White House of the Confederacy -- the last place that the Confederate cabinet met with Jefferson Davis. While I was up there, though, I also stopped by a National Cemetery that was built for United States soldiers who died while imprisoned in Danville. It's adjacent to two other cemeteries -- a traditionally African American cemetery and what I take to be the leading white cemetery for Danville, which unsurprisingly has a Confederate monument. I took a bunch of pictures of them, which I want to use down the road -- but right now what really interests me is the intersection of the cemeteries. The National Cemetery is in the upper left; the African American Cemetery is on the upper right (to the right of the stone wall surrounding the National Cemetery); the white cemetery is in the foreground. I'm not familiar with any other conjunction like that elsewhere. 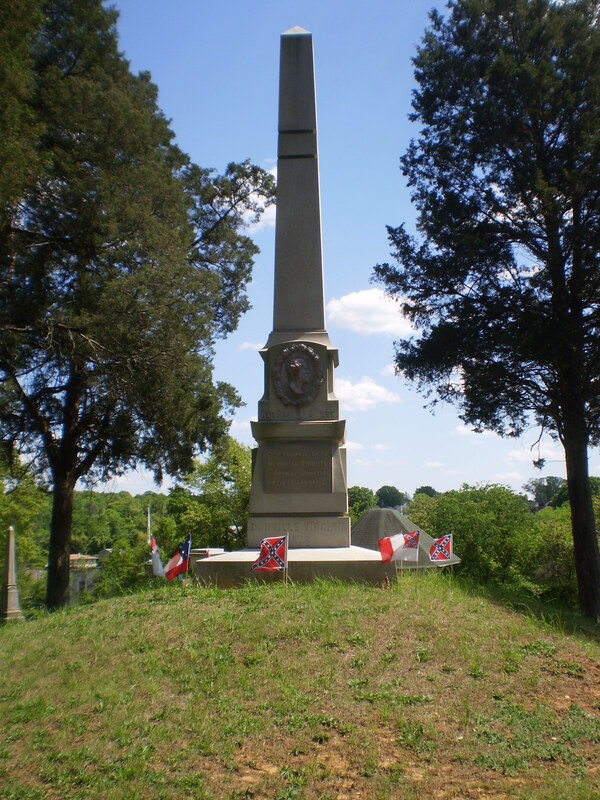 Some believe that some of the Confederate treasury is buried in a Danville cemetery, as that was the last place it was officially accounted for. I'd forgotten about this story. I must say that having seen Danville I'm thinking that's pretty unlikely.